Progressive has brought the Baby Man back into the spotlight. The man-child character, first introduced in 2014 and designed for the Facebook placement, returned to the small screen in a new commercial. 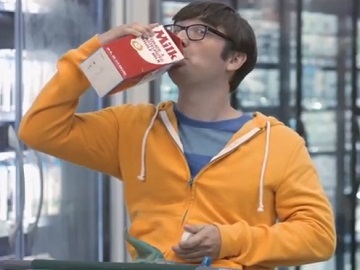 The ad features the grown man in his 30s sitting in a shopping cart and acting like a baby in a grocery store, where he throws boxes to the floor, spills bulk foods and drinks milk directly from the box, and at the kindergarten, where he slugs water from a sippy cup, eats biscuits and discovers “terrifying” books. While the 2014 ads ended with the text “Save @ Progressive.com” flashing across the screen and the voiceover saying “Act your age! Dump your parents’ insurance company,” this time, the final line is “Act your age! Get your own insurance!”. The Baby Man campaign targeted millennials that, according to a survey, turn to their parents for help on financial matters, including insurance, rather than looking for a policy that fits their needs. The ads featuring the Baby Man, created by Arnold Worldwide, first appeared May 6, 2014, on Facebook’s Premium Video Ads, making Progressive be the first brand to use the medium.